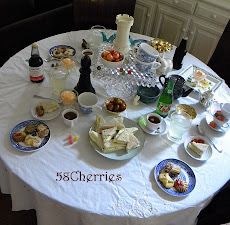 Art, Crafts and Decor by 58 Cherries: Jump Down the Rabbit Hole...A Mad Tea Party with 58 Cherries! what fun! sneaking into a party the night before... it was a lovely party. thanks ever so much. What a wonderful mix of Party Guests! 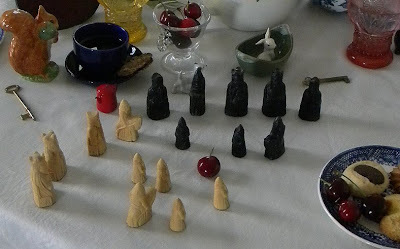 Everyone seemed most delighted to attend....except maybe the chessmen who had to fight over that cherry...heehee! Truly Lovely. Mine will appear in the morning, but I couldn't resist looking if it's there to see. I love the chess fight, lol. A great party- especially the gnomes- check ou mine tomorrow evening!!! Well...considering it is after midnight in New York and on the eastern seaboard...I guess it is Friday there...so why not enter in with the midnight fun? I like all of your sweet bunnies, and the gnomes, and all of the goodies. 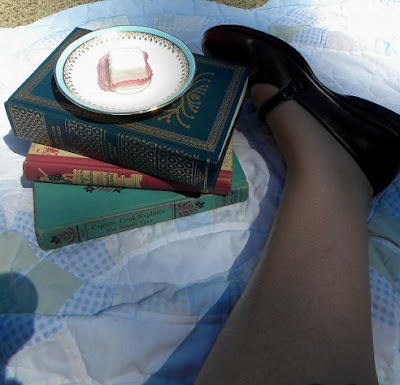 Please enter me in your giveaway, and come on over to my blog too! 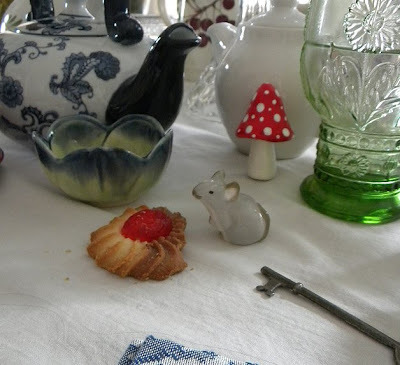 I love the little mouse that ate the cookie. amazing party!!!! thanks so much for inviting me!! Oh! all the little mini friends and those shoes! Delights everywhere! Thanks dear one! Blessings. Your party was divine and your yummy treats delish! Thanks for letting me crash the party. 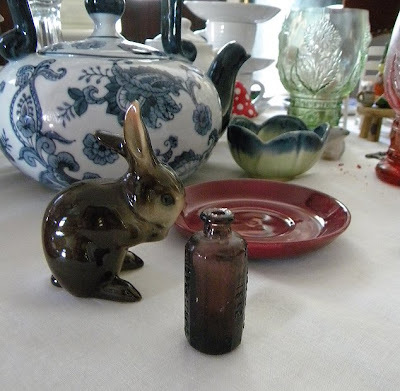 LOVED the tiny ceramic bunnies and grey mouse. Thank you for inviting me to your party! such a lovely tea party!! 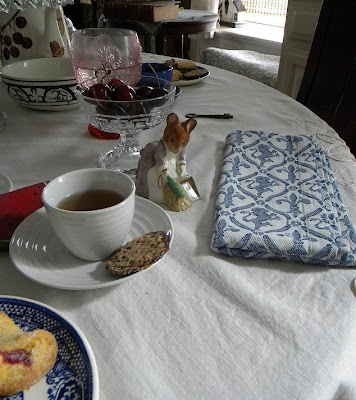 i am having so much fun visiting tea party after tea party! thank you for a lovely cup of tea! 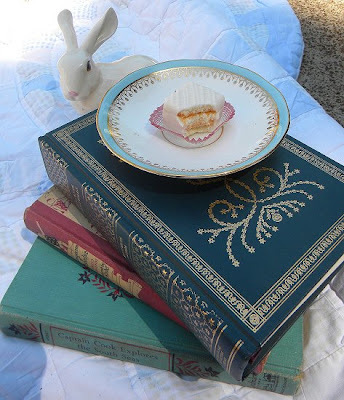 what a cute Mad tea party post! I love your table and your madness! I have enjoyed your party very much! What a wonderful dream! I loved traveling with you and the tea was delicious. What an enchanting dream! 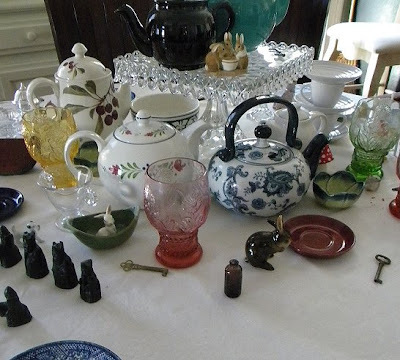 Really lovely, and I had fun looking at all the teapots too (I collect them, hehe)...Please do throw my name in the hat for your drawing!! 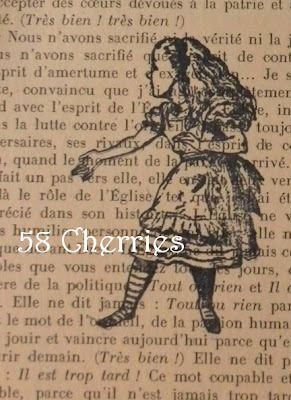 I adore Wonderland and paint it often myself. oh I do delight in vintage goodies. What a great party you do throw. I have a little party of my own and gifts for all of my guests. I do hope you can stop by. Thank you for the peak into your tea party. Such fun! Thank you for the lovely party :) And a fun giveaway, too! I do hope you can stop by my little party! 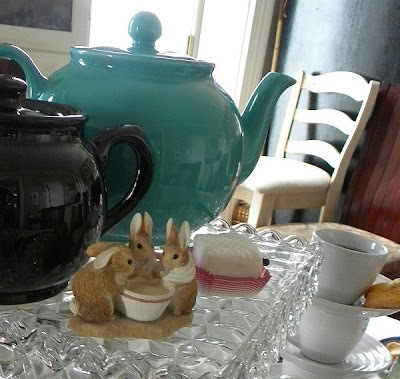 You and I have the same greenish color tea pot, yay! I love mine and use it all the time. 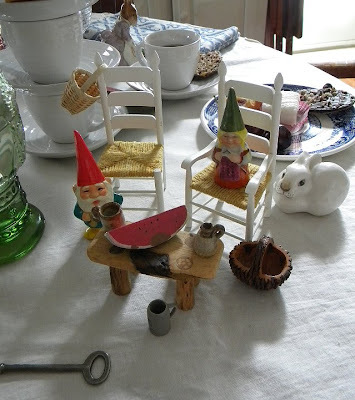 Adorable tea party! Was it a dream or not?! Lucky us we got to enjoy the delicious treats! Thanks for sharing! A fun and magical party, thank you! Wishing you a most Happy Mad Tea Party Weekend! You know, it's not a true party until the gnomes arrive! 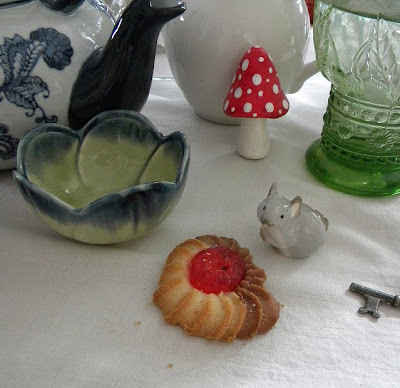 :) Lovely tea party - so glad I stopped by! Thank you for a lovely time...enjoy the festivities! I can't tell you how badly I want a piece of white cake now! 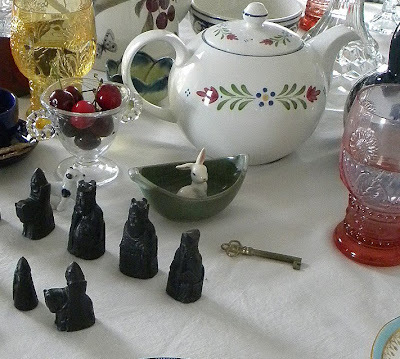 The bunnies and mice and chessmen were all such fun. I hope it's alright that I, a guy, came and joined along. 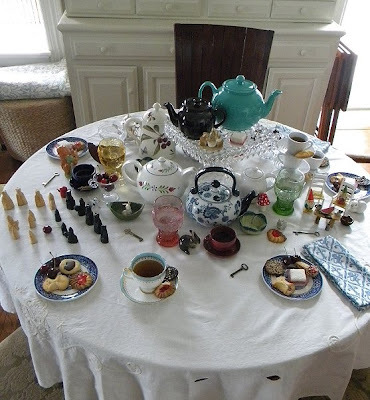 How could anyone resist a tea party like this one?! OH YOU!! I came in and peeked last night ;) I love your tale, waking up back where you began, not a crumb in sight! Your table in your beautiful room is beyond lovely! This was so delightful! Thank you for sharing your beautiful Wonderland! Treasures indeed - you have so many of them in this post. I enjoyed my stay and would of course - like everyone else love to win. Drop by my blog for a change for a prize as well. You have created a real enchanting story! Thank you so much. 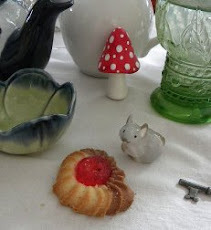 I love all the details, the Beatrix Potter ceramics and ..oh my...how I love the little gnomes! I wish I could have bitten in this delicious white cake too. This is such a funny comment Catherine! The dolls' houses I build are actually 1/6th scale. My dolls being taller that 1/12th, I design everything in a bigger scale. 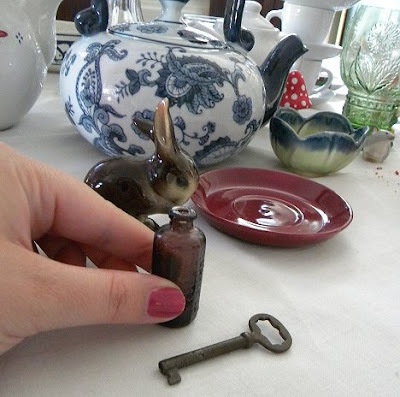 I have seen some very old dolls' houses at the same scale and fell utterly in love with them. Since then, it has been an obsession. Probably because of the challenge it represents. Hence the constant mix and match with 1/12scale and other objects. Do you feel reassured now? 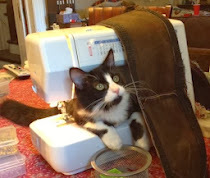 It was such fun to put Lotte in the house and she didn't want to get out of it. She even asked me to put water in the little cup so she could really drink. 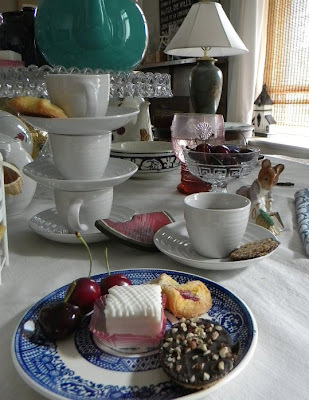 Such a delightful dream tea party! Thank you for having me! 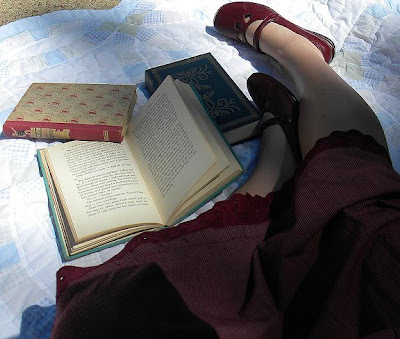 Very sweet and it makes me want to grab a few books and an old quilt and find the shadiest tree! Some wonderful guests at the tea party with you! A lovely tale! Thank you! What a wonderful party! And all those little gnomes and bunnies. Too cute! Happy hoppin'! Simply divine party Ma'am !! 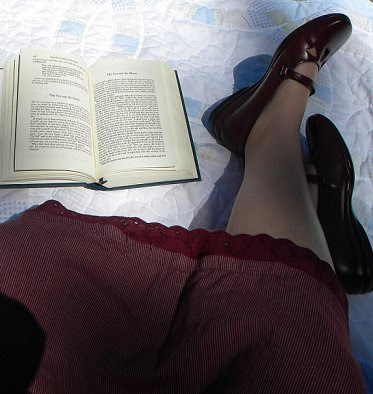 Love those beautiful shoes as well I must say. Thoroughly enjoyed mysel! 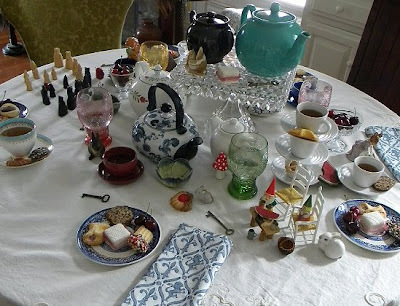 Thanks so much for inviting me to this enchanting tea party! I had a lot of fun! 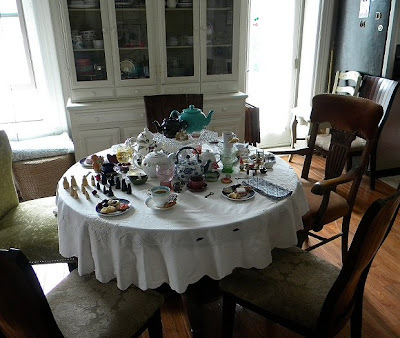 I hope you will visit my tea party as well! 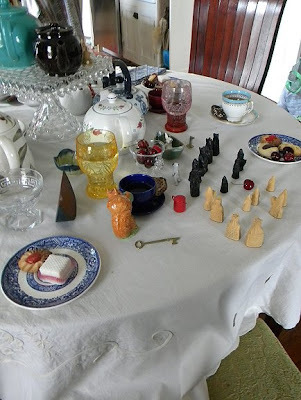 Such a wonderful and magical to-do, thank you for inviting me over to share your tea and enchantment! I do so love the gift you've offered up, how divine! And, I must say of all the treasures and guests, the gnome couple just tickled me most! 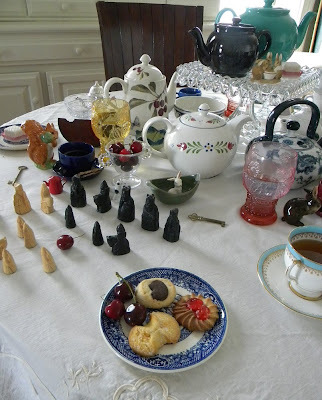 Was so glad to be a part of this wonderful tea party! Your pictures are gorgeous! What a lovely tale and so many fanciful characters and creatures I would love to meet. I am glad I did not have to clean up after them tho, seeing as I am so late. 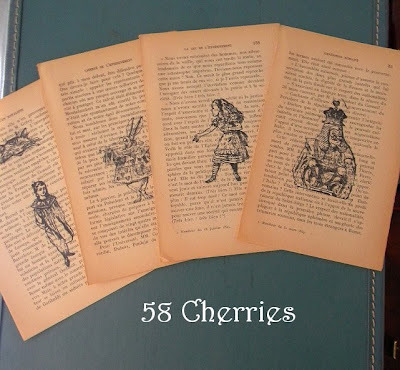 Please enter my name in your drawing as I would be happy to hang those pages on my wall. What a lovely party! And such a lovely gift! 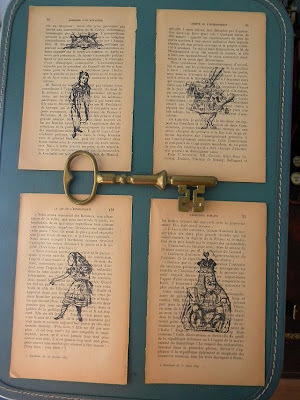 Alice in Wonderland is one of my most favorite books. I'd love to receive such a gift! So sorry I am running late to your party. I have been following that crazy white rabbit and he has no idea of the concept of time!! Your party was sweetness indeed. Thanks so much for inviting me!!! This was just darling and so much fun. Loved all your little characters. Well done!! 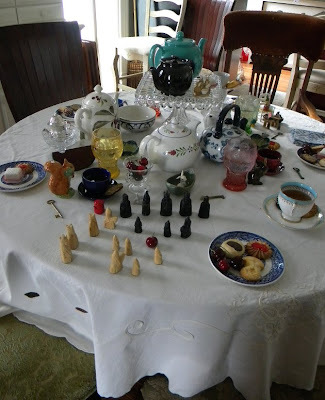 Sorry for such a late comment, it's taking me a while to get round all the tea parties.